KCF in Malaysia – Design Research. Experience. life. When I was in Kuala Lumpur (KL) CBD a month ago, resuscitator I tried to travel around using public transport. Just to check out and update myself with the services. And to experience the changes. Fortunely the services have improved. More people choosed to take public transport than drive. That makes the “Rapid KL” and other public transport services, here the LRT and buses improved their services. 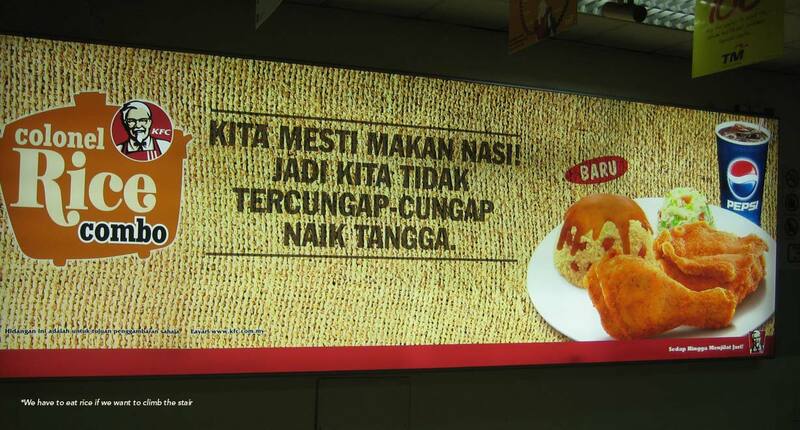 While taking underground LRT in KL, I saw this advertisment. I find this KFC adds interesting. For sure this add will not sell or perhaps will never have the chance to be on the billboard in any western country. It says “Kita mesti makan nasi! Jadi kita tidak tercungap-cungap naik tangga” , “We need to eat rice! So we will be able to climb the stairs in a good shape.” Malaysian citizen loves “nasi” rice. Just ask anyone, to the extend that we even make some of the ‘sweet’ dessert with rice flour. As one of the marketing strategies KFC attracts their customer by adding the “culture values” in their menu. KFC serves with rice. A mixture of East (Rice) and West (bread). KFC is one of the biggest sales ‘fast food’ in Malaysia, therefore in order to keep the customer happy they keep on inventing their product that can fit the local taste. Myth? : Some even said that KFC is much better taste in Malaysia or Asia. I wonder why? Previous PostPrevious 4th GRC – moved on!